Multiplayer Hub - Online Game Forums • View topic - Age of Conquest IV - ALPHA-Testing! Post subject: Age of Conquest IV - ALPHA-Testing! As you might have been eagerly awaiting, I finally managed to put the 1st ALPHA-release together for Age of Conquest IV. D) the game is most likely buggy. E) feel free to share this with friends. F) I'll eventually wipe the server clear, so don't get attached to it. 3. Was it worth it and do you want to come back for more if fixed? 4. 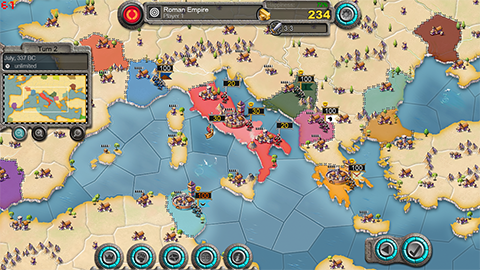 How does it compare to Age of Conquest III (current/previous version)? 5. Other comments (anything goes)? Post subject: Re: Age of Conquest IV - ALPHA-Testing! Watch Tower/Fog of War: Watch Tower can see 2 or 3 provinces far. You can always see neighboring provinces now. Good/Bad? Size of Water Provinces compared to land provinces (ships can move 3 tiles! ): are they OK? Should the be the (a) same, (b) larger, (c) smaller? Ships can "stay" on water provinces: good/bad? This is actually an option that can be set in the setup screen to make it so v4 behaves as v3. Ships can travel but NOT stay on water provinces. I.e. direct land-2-land movements only. setup option: (a) no diplo (ditto v3): I'd rather drop that. setup option: (b) no management (ditto v3): I'd rather drop that. setup option: (c) declare war (ditto v3): in v4 you have to declare war first before going to war. I could add an option that will auto-start wars every time you enter a nation's territory you don't have a diplomatic relation with. I feel however, that declaring war first is the cleaner way to go about it? setup option: (d) recruitment of troops (ditto v2): I'd rather drop that. setup option: (e) no pillaging (v4): I don't think this option is really needed, so I haven't added it. setup option: (f) no abandon (v4): I wonder if that might be a good option, i.e. re-cheating! setup option: (g) other setup options: suggest! remove happiness? I think it should stay, but maybe there are some cons against it? add: Village "Estates"? Demise of Nations has the option for city-building, e.g. build a tax collector's office or so. Not sure if that's really suitable for AOC though? Good/Bad/needed? re-setup options: even if we decide not to add those, I can always add them in the future if enough interest is available! The question is, which ones do you want to have being in there RIGHT NOW (from when the game is release)? I can tweak things as we go, so a "no" now can be changed to a "yes"-vote later. Which ones are important to have from game-release on and which ones do you really plan on using if I'd add them? Anything that needs changing/is bothersome? Please comment! I'm on Windows 7 and 10. I've just run the game in 10 for now. Wow this is beautifull! Nice work! Tower : Good, really good actually. Water moove : same or larger, but definitively not smaller. Ships can stay in water : yes of course! but you need to allow naval war. and then less important but troops could be affected badly if they stay too many time in the sea. Something is not realistic, if i have a boat with 10 people in the sea i can reach in the same turn 10 countries! When troops are in a boat you shoud not be able to choose how many troops you moove there or there, they are all in the same boat. Agree for the rest, except pillaging souds good to me. Don't remove hapiness, I'm so happy you redo it, country by country. Hapiness in v3 could be removed cause it was useless, but hapiness in that way was the heart of v2 dynamic for the 10 first turns. i can't moove the map with my mouse like i used to do it. I see what you are getting up. However, there is a single soldier standing there too even though you have maybe 100 troops at a location. It's more of an abstraction to indicate how large your troops are. It should work like before!? You can move the map with (a) via touch-scroll, (b) moving the mouse to the edges of the game window (c) ASDW-keys or (d) arrow-keys. Which isn't working? What happens & what did you expect to happen? Actually this is a really good point. But I imagine could be very difficult to change. It may be easy to force you to move all units when you are moving from sea to sea "province". But then what if you move 100 units from sea to another 100 units at sea, and they merge. Then you can no longer split those 200 units, which just a turn ago were split. Probably no simple solution, so the best thing to do is to imagine there is not just one ship, but many. Just as noble said with the soldiers. Graphically, could we show more than one ship similar to soldiers on land? There is already more than one ship shown if you move more than let's say 100 troops (ditto soldier). Because 10 troops is somewhat small only 1 land soldier or 1 ship is shown to represent. I guess I could add an option that only troops with let's say 10 soldiers minimum can be created/split? That should be doable. It's not that big of a deal to do. Thoughts? Ah, haven't seen multiple ships yet then. I would say it's fine as is, no need to change anything. What i expected to happen : for example that the map mooves to north when i put my mouse in the top of the screen. I've tried it in full scren and normal screen with same effect. I may try it this afternoon with my other computer wich runs 7. Ok, sounds good for the boats. I see! The map should definitely move (works for me on Windows 7). Not sure about Windows 10 then. Don't have a machine for testing. It was little bit tricky to detect when the mouse leaves the window. I assume that's broken on Windows 10 as it seems. Yeah, working for me here on Windows 7 as well. I got 1 question: do you like the new system being able to move your troops everywhere? Or would you prefer things to be more like v3 where troop-movements are restricted to your own territory? I like it, but I think we should only be able to move through land of other players that we are protecting, under protection, or allied with. Not sure about peace or cease-fires. This would probably cause some complications though if we have troops in an allied territory and someone we are not protecting/under protection/allied with takes that land. Where do our troops go? Yes, that's the problem if your relation with a nation changes and you have troops on their land. Not sure how to fix it so it would make sense? Considering that I think it's either being able to move everywhere -or- like in v3 only in your own territory. Maybe there are some good ideas?